Private Archives Section has in its custody a rich collection of private papers of eminent persons who have contributed immensely in various fields of public life in India. These papers have been acquired mainly through donations and gifts from individuals and institutions across the world. They are an important source to supplement the information contained amongst the public records. Some of the most important private papers in our custody are those of Mahatma Gandhi, Rajendra Prasad, Dadabhai Naoroji, P.D. Tandon, Maulana Azad, Minoo Masani, Sardar Patel, K.D.Malaviya, etc. All these private papers are accessible as per provisions contained in the Public Records Rules, 1997 or conditions as laid down by the donor at the time of their donation to the National Archives of India. For searching among various private papers as listed below, please visit www.Abhilekh-Patal.in or the Private Archives section on completion of registration procedures. 943 issue of old newspapers (939 issues of Urdu newspapers and 5 issues of English newspapers). These include Ahl-i-Hadis (1916-1920), Hamdard (1915-1929),Al-Asr (1917), Tarjuman (1916); Muslim Gazette (1912-1913), The Muslim Chronicle (1929), The Independent (1922) and The Statesman (1913). 2. Ambedkar Papers:- 123 letters in English, Marathi and Hindi (1920-1954) – throws light on Dr. Ambedkar’s literary activities, his pursuit of professional legal work and his efforts to secure political and social rights for the Depressed Classes. 3. Badruddin Tyabji Collection:- 1122 items/letters relating to his correspondence reports, speeches, notes and invitation cards, etc. (1871-1919). Relating to Satyagraha, which Gandhiji launched in Champaran in 1917 to redress the grievances of the Indigo Cultivators. 31,000 items – relate to campaign in England – Agitation for simultaneous civil service examination in India and England, admission of Indians in public services. 13. Gooroodas Banerjee Papers:- 303 letters (1877-1918) - mainly correspondence on educational problems, constitutional reforms and religious and moral teaching in Govt. Schools and Colleges. activities of various branches of the Indian Independence league in Thailand, Shanghai, Malaya, Singapore, etc. 1100 items (1900-1963) comprising of magazines, correspondence, news papers, etc. 19. Jehangir C. Coyajee Papers:- 1202 items (1902-1946) - comprising correspondence, press clippings, articles, photographs, etc. 20. Joseph Bampfylde Fuller Papers:- 51 letters (1930-1948) pertaining to democracy and discipline, customs in India and Europe, Hindu-Muslims Unity, etc. 21. K.M. Panikkar Papers:- 1350 items (1938-1963) - comprising letters, articles and press clippings. 11,000 items (1912-1981) - comprising correspondence, press clippings, reports, etc. 455 items (1947-65) - comprising correspondence, articles, notes, book reviews, etc. 24. Lahore Conspiracy Case:- Mainly proceedings and copies of judgement of Lahore Conspiracy Case and material relating to Martyrs Bhagat Singh, Rajguru and Sukhdev (1930-31). 25. Lala Hardayal Papers:- 15 letters addressed to Sardar Singh Rana and Mrs. Rana in Paris (1910). 26. Lala Lajpat Rai Papers:- Diary (1914-1917) showing his movements during his visit to U.S.A and Japan. 28. Nanavati papers:- 5 Volumes and other papers (1944-45) relating to Bengal Famine Enquiry Commission. 4,226 items (1929-1933) throwing light on the history and growth of Communism and Trade Union Movement in India and International Communism and its impact on India. 31. M.R. Jayakar Papers:- 7,000 items (1823-1958) - comprising correspondence, diaries, press clippings and miscellaneous papers. 264 issues (1907-1942) of Zamana News Papers and some typed material. 33. Mutiny papers:- 62 letters (1857). 34. N.B. Khare Papers:- 179 items (1935-68) relating to his correspondence, Book and Press clippings. 1,020 +14= 1034 items (1909-1970) comprising correspondence, speeches, press clippings, articles, books, papers relating to Jharkhand movement, Anthropological Survey of India, files relating to Institute of Advanced Studies, direction action 1946, two personal diaries and some miscellaneous files, etc. 36. P.K. Malviya Papers:- 3,720 items (1907-1969) - comprising his correspondence and Abhyudaya. 37. P.S. Sivaswamy Aiyer Papers:- 10,000 items (1889-1946) - relating to correspondence, press clippings, speeches, books, journals, etc. 39. P.D. Tandon Papers:- 28,738 items (1926-1960) relating to his correspondence, News papers clippings, pamphlets, booklets, etc. 41. Rajendra Prasad Papers:- 34,900 items (1935-1962) comprising his articles, notes, correspondence, press clippings, speeches, pamphlets, etc. 42. R.C. Dutt Collection:- 40 items and a notebook (1901-1909). 17 items (1846-1907) regarding Europeans in the Army of Maharaja Ranjit Singh. 1,907 items (1922-1968) mainly his correspondence and some literary works. 45. Sarojini Naidu Papers:- 34 items (1896-1911) - consists poems and songs. 47. S.S. Bhatnagar Papers:- 21 items (1942-1954) relating to reports and proceedings of the meetings on various aspects of scientific developments. 48. S.C. Dixit Papers:- 100 items (1869, 1934-1975) - comprising newspapers, periodicals, etc. 49. Sita Ram Papers:- 56 files (1906-1967) relating to his correspondence. 50. Srinivasa Ramanujam Papers:- One volume (1912-1920) throwing light on his life and his work. 7 files (1928-1961) throwing light on various problems of Tata Workers and growth of Labour Movement in Tata Nagar, Jamshedpur. 53. United Service Club Papers:- 115 itmes (1870-1961) relating to club at Simla. One volume (1917-1921, 1955) relating to his revolutionary activities. 55. V. Krishna Swamy Aiyer Papers:- 350 items (1898-1911) relating to his correspondence. 56. V.S. Srinivasa Sastri Papers:- 1,354 items (1889-1946) relating to correspondence, articles, speeches, etc. 57. Woods Collections:- 62 items (1931-1946) relating to correspondence with S.C. Bose and V.J. Patel - Photographs and Press clippings. 363 items (1890-1955) containing addresses correspondence , press clippings, photographs, etc. 60. Lala Murlidhar Papers:- 95 items containing sanads, correspondence, invitation cards, notification, etc. 61. N.G. Ranga Papers:- 132 items (1934-1986) containing correspondence, articles, speeches (xerox copies). 62. Rana Jang Bahadur Papers:- 104 items (1924-1986) containing correspondence, articles, testimonials, addresses, etc. 63. M.C. Chagla Papers:- 223 items (1921-1981) containing speeches, articles, photos, correspondence, press clippings, etc. 64. Danial Latifi Papers:- containing correspondence, notes and a booklet. 65. Madras Chamber of Commerce and Industry Papers:- 92 vols. (1836-1962) containing reports, etc. 66. C.P. Ramaswami Aiyer:- 41 microfilm rolls (1914-1966) containing speeches, correspondence, radio talk lectures, press clippings, etc. 67. C.Rajagopalachari Papers:- 15 microfilm rolls (1930-1959) containing correspondence. 69. Shiv Shankar Rawal Papers:- 62 packets (1931-1951) containing correspondence, books, periodicals, etc. 70. Phoolchand Jain Papers:- 425 items (1830-1947; 1985-1992) regarding Delhi Satyagraha, Quit India Movement, Ghadar Party, Indian National Army and Mahatma Gandhi. 11 Microfilm rolls regarding American Mission Papers and 20 Books. 72. Chaudhri Ranbir Singh Papers:- 25 items and 48 photographs (1898-1990) relating to Constituent Assembly, Sanads certificates, etc. 73. U.G. Krishnamurti papers:- 418 items (1939-1999) having correspondence, press clippings, magazines, books, pamphlets, photos, 26 items containing printed books in English as well as in different languages. These books contains the ideas of philosophical thought and rational approach relating to life, God, courage, etc., quotes of U.G. Krishnamurti, set of 108 money maxim cards; CDs/VCDs of U.G.’s interviews world over and file containing copies of web pages links and postage stamps issued in USA on U.G. Krishnamurti. 74. Minnoo Masani Papers:- 7 folders (1933-1974) having correspondence, articles, press clippings, photographs. 75. Lal Bahadur Shastri and Hari Kishan Shastri Papers (1931-66):- 15 items (42 folders), 1,528 xerox copies, 5 files/folders containing correspondence, speeches, broadcast, messages, press clippings pamphlets and abhinandan patras. 76. Nanaji Deshmukh Papers:- 17 items relating to letters, addresses and speeches. 77. Comrade Ramchandra Papers:- 9 items containing books, text of interviews, etc. 78. Dr. Suryya Kumar Bhuyan Papers:- All items (1894-1964) containing speeches, correspondence, articles, books, etc. 79. 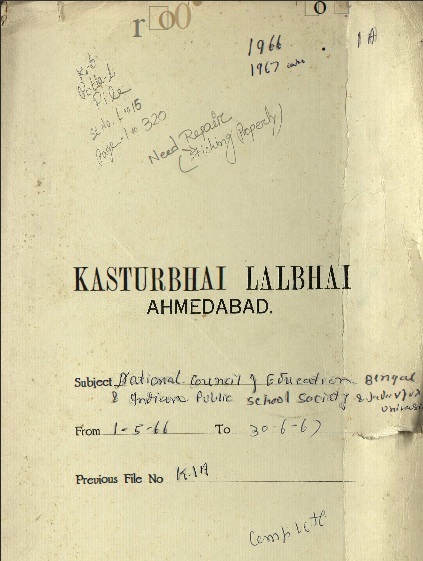 Kasturbhai Lalbhai Papers:- 147 bundles (1936-69) containing correspondence, books, diary, etc. 80. Gulzari Lal Nanda Papers:- 35 bundles (1954-1977) relating to correspondence, books, etc. 81 Yashpal Kapoor Papers:- 19 items (1956-64) relating to correspondence and articles. 23 items (1975-1979) relating to his correspondence. 83. B.N. Pande papers:- 44 items (1936-1964) relating to his correspondence. 21 items (1927-1932) relating to self and his correspondence. 86. O.P. Paliwal Papers:- 54 items (1961-1991) relating to his correspondence. 87. S.L. Bhatia Papers:- 146 items (1916-1982) comprising printed books, articles, journals, letters and files relating to his correspondence. 34 enclosures / photographs relating to the activities of Netaji Subhas Chandra Bose in Central Europe. 89. R. Venkataraman Papers:- One album containing 28 photographs. 4 Vols. relating to the trial. 91. Morarji Desai Papers:- 2,500 pages (1952-1980) – correspondence, articles, photographs, speeches, newspaper clippings, etc. 93. Punjab Conspiracy Case:- Judgment and Index of case. 84 items relating to Indian Communist Party, his correspondence, books and biography (1925-1968). 95. Dr. Y. Subbarow Papers:- 1893 items (1922-1955) relating to Scientific matters. 96. Navin Chandra Rai:-A book. 12 packets and 4 boxes (1538-1984) relating to his correspondence. 99. Subhas Chandra Bose Papers:- Books, speeches, leaflets, etc. (1934-1984). 100. Pherozeshah Mehta Papers:- Correspondence with eminent personalities (1846-1917) (in Microfilm rolls). 168 rolls relating to correspondence and press clippings. 102. Zorawar Singh Niam papers:- Regarding Etawah Conspiracy Case Papers- correspondence, Press Clippings. 103. Proceeding’s of the trial of Hari Kishan and Judgement of the Session Court at Lahore. Crown Vs Dr. S.D. Kitchlew, Dr. Satapal and others (1919) - One Microfilm roll. Crown Vs. Gopinath and others. (1919) - One Microfilm roll. 107. Trial proceedings of Shaheed Mangal Pandey and others (1857). 108. Material relating to Bangladesh books, pamphlets, newspaper clippings (1971). 110. 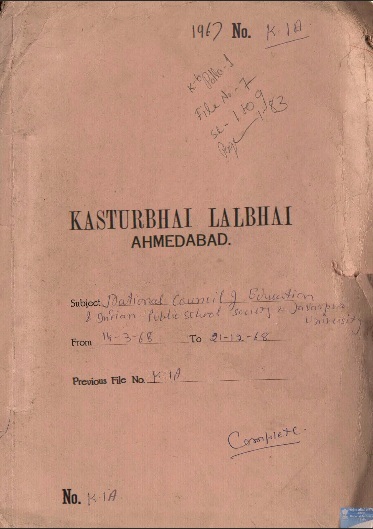 Bardoli Satyagrah Papers in Gujarati (1939-48) - One microfilm roll and 3 Vols. of Harijan. List of passengers who travelled on the aforesaid ship. 112. Lhasa at Last by Evan Trigh Croslegh (1903-1904) (one diary). 113. Shiv Shankar Rawal Papers:- 62 Packets. 114. India Divided -Manuscript of the book by Rajendra Prasad. 115. History of Freedom Movement:- Material relating to Freedom Movement in various regions of India (1857-1947). Relates to science of numbers (Ank Vigyan). The manuscripts are stated to throw light on ancient Hindu art, civilization, medicine, mathematics and other sciences. Relating to pension and repatriation of her servant in 1970. One book, two vols. and some xerox copies of documents. 119. Atulya Ghosh Papers:- 34 items and one book. 120. N.Sanjeeva Reddy Papers:- 56 Vols./ folders (1953-1982) relating to correspondence with eminent personalities. In 7 microfilm rolls containing correspondence, court papers and press clippings (1916-1957). 122. Qaumi Ekta Papers:- 15 microfilm rolls relating to the events and issues in Punjab, articles on Sikh history, life and culture (1974-1986). 123. Daya Narain Nigam Collection:- Containing 29 issues of Zamana, photographs, material, etc. (1907-1942). 124. R.H. Col. Phillimore Papers:- 42 Vols./36 maps containing Historical Records of Survey of India. A book – ‘Oaten Incident-1916’ and 13 letters. 126. 47 Issues of Young India, The People and National Front (1924-1938). - Hindi Weekly from Allahabad – 16 issues, (1918-1919). 129. Dr. H.S. Pareek Papers:- Material relating to his correspondence (1945-1995) (with gaps). 130. Institute of Actuaries Papers:- Relating to Madras Military Fund Life Insurance in India Indian Railways (1933-41). 131. Association of Indian Universities Standing Committee Minutes: - Comprising 10 Vols. (1967-1990). Consisting 228 items (xerox papers ) on P.D. Tandon, Lal Bahadur Shastri, Congress working, agrarian reforms, local self government and Lala Lajapat Rai (1920-1969). 138 Shri Jitendra Prasad Papers:- 10 files of private papers of late Shri Jitendra Prasad (former Vice President and General Secretary of Indian National Congress) relate to correspondence of Smt.Indira Gandhi, Rajiv Gandhi, Arjun Singh, misc papers, press clippings and condolence messages, etc.